If you’ll recall from Part 1 of this adventure, my husband and I embarked on a epic day trip to the NH & ME Seacoast area, with the goal of getting ice cream three times in one day. In part one, we found the Seacoast, after a false but wonderful start, and then indulged in some delicious Lago’s ice cream. My husband and I will both be working at Jean’s Playhouse in Lincoln this summer. It’s a traditional summer stock model, which means for the uninitiated that I will be living and breathing theater this summer, and my husband Ross, although he’ll have more non-theater time than me, will be getting a taste of the strange world of professional theater that I spent many years working in. Due to this upcoming schedule change, it’s become especially important to me to visit a new ice cream place each week and “bank” some visits. It was with all of this in mind, plus the realization that we should head to the beach now because we wouldn’t have a vacation or time to visit the beach for many months – that inspired this adventure. Obstacle number 1? As we drove on Route 101 East, I started asking questions. We quickly realized that neither of us actually knew how to get to the coast. I had a vague memory that we wanted Route 1. We were in no rush to get, there, of course. Which is a good thing, because after wandering Route 1 for a while, stopping at a phenomenal candy store (Sanborn’s Fine Candies) and a charming cafe & bookstore next to it, Ross said something like, “You know what? 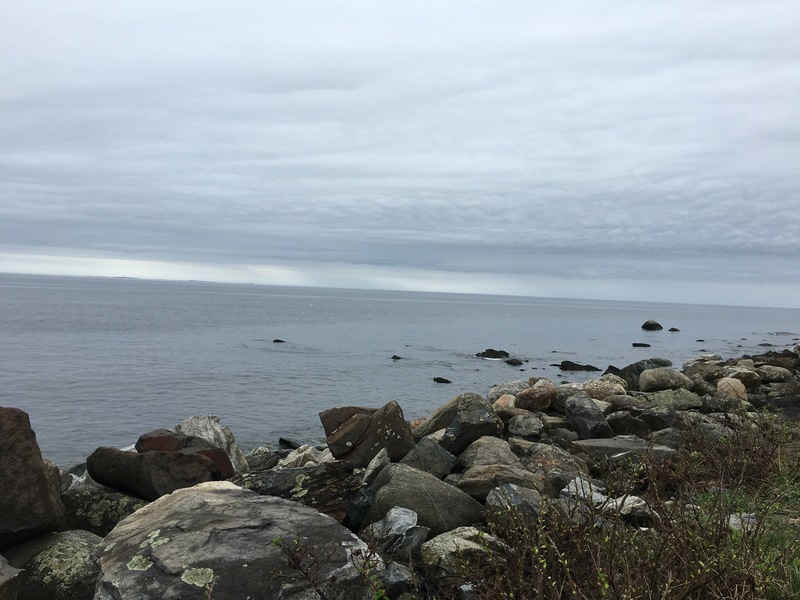 I think we’re actually supposed to be on Route 1A.” So after rejoicing that we’d gone Route 1 and found these awesome places in Hampton, we headed to the actual coast for some beach driving, with a pause of course to actually get out, stand on the rocks and admire it all. It was gorgeous, as usual, and after some viewing of most of New Hampshire’s 8 mile coast line, it was time to head to our first destination – Lago’s. Lago’s Ice Cream in Rye, NH and I go way back. Back about 8 years, to be exact, when I would frequently stop at Lago’s for a delicious if indulgent meal of ice cream. I also fondly remembered their frozen yogurt selection. And of course, it’s all homemade. So with a much more seasoned palate than I had back then, we followed the GPS – and didn’t find it. After I followed my nose a bit, we DID find it (the GPS overshot things, but we were very close) and we eagerly headed over to the menu. I remembered that Lago’s had gargantuan portions. Knowing that we had a long day of eating ahead of us, we decided to go with a baby cone each. And honestly, that was just fine! Plenty to satiate us for a while, and I’d brought some healthier lunch/snack stuff in case we needed it later. I knew that at a baby size, one flavor would make sense, but I did ask to try the Black Raspberry Oreo yogurt. It’s a very bright, fun raspberry flavor. It’s “real-ish”, but not the best black raspberry I’ve had all year – that goes hands down to the Wright Place, of course. But oreo with raspberry is an absolutely fantastic combination, and they were really generous with the oreos! Glad to see my memories of their yogurts were validated. The baby cones were cheap. With tax for the two of us, it came to $6.54 ($3 each without). Ice cream is always a little bit more expensive on the Seacoast (maybe everything is?) but we were satisfied with the price overall. Tag-a-long: Ross ordered this one, inspired by the Girl Scout cookie of course. It’s very complicated, with a cake batter ice cream, chocolate fudge, vanilla frosting, peanut butter, chips ahoy cookies etc. I only had a bite, but it was very tasty and Ross seemed pleased although he doesn’t usually go for such things. “A cocktail of candy designed to honor the third best Girl Scout cookie” was his description. It’s very smooth and full of stuff! S’Mores: The vanilla base is pretty heavenly, it melts in your mouth. The big and tasty chocolate chunks are high quality, and there were some actual marshmallows too. The base actually tasted a lot like marshmallow to me, but upon further reflection I decided it must be vanilla. This is a light and fluffy ice cream. Very good overall. The consistency here of mixins isn’t always stellar, but it’s generally a very satisfying, high quality ice cream. I l ove the flavor list here, it’s more than 40 different types of ice cream plus yogurts, a dozen specials etc., and they have both indoor and outdoor seating. Keep in mind that it’s cash only! Also, they make their own whipped cream. Which means we basically failed because we didn’t get it, so you should do that! To learn about the violent turn that our epic adventure took, you’ll have to stay tuned for part 2 in a future blog post. Thanks so much for reading! 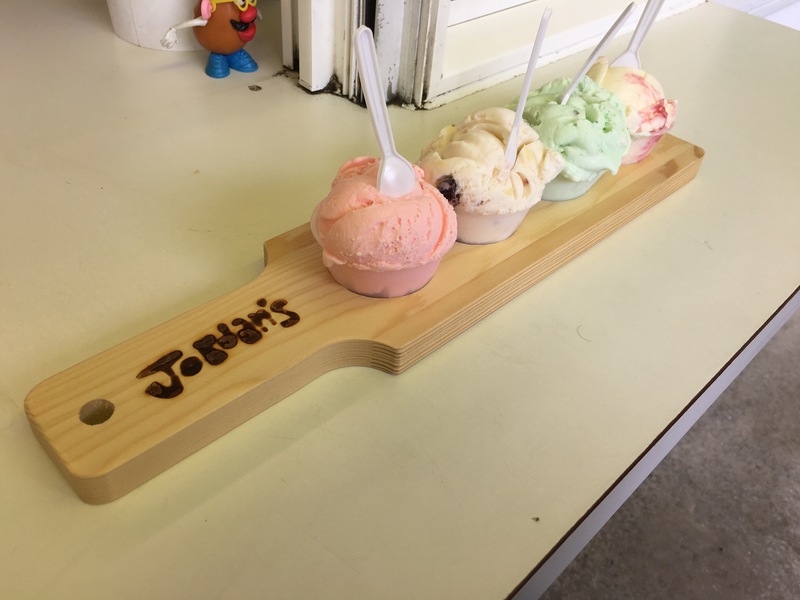 Ice Cream Flight #2 at Jordan’s Creamery! Keeping it short and sweet with this post since I’m behind. You can expect the beginnings of an exciting series this Friday though! Learn about last month’s flight here! Flavor #1 – Teaberry – It’s exactly like Pepto-Bismol! Since I like that flavor, it was charming, particularly with the creaminess of ice cream. But I’m so glad I just had a small scoop…not my favorite, LOL! Flavor #2 – White Sangria with strawberries, pineapple & cherries – Full of dried fruits aka fruitcake and a clearly alcoholic base, this was kind of fun, but honestly, not my favorite thing. I’m pretty picky about mix-ins and this was clever but not something I’d normally go for, although the cherry was quite tasty. Flavor #3 – Mojito with organic mint leaves- Oh my goodness. It’s kinda minty, kinda alcoholy and absolutely delicious. More please! So refreshing. Flavor #4 – Mascarpone & sweet cream with red raspberry swirl- Super delicious, creamy and cheesy. I love mascarpone cheese and it’s absolutely perfect as a creamy ice cream. It’s great alone and as a base for fruity goodness. Very glad we went – I’d order mascarpone and mojito again in a heartbeat! Thanks again, Jordan’s! We’ll be back!